An absolute delight! This is the gathering place of the Gods, the point where water, rock and mountain meet to play. 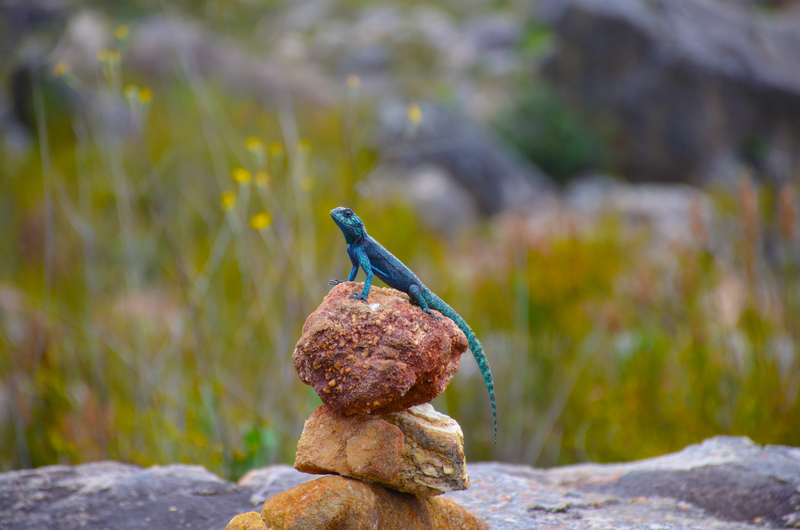 If you are a nature lover, this is pure indulgence. 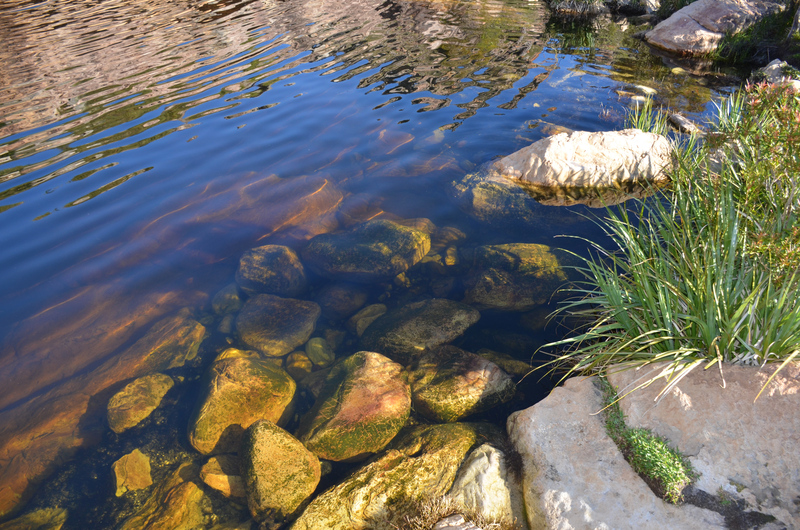 For years we have been hearing about Beaverlac. 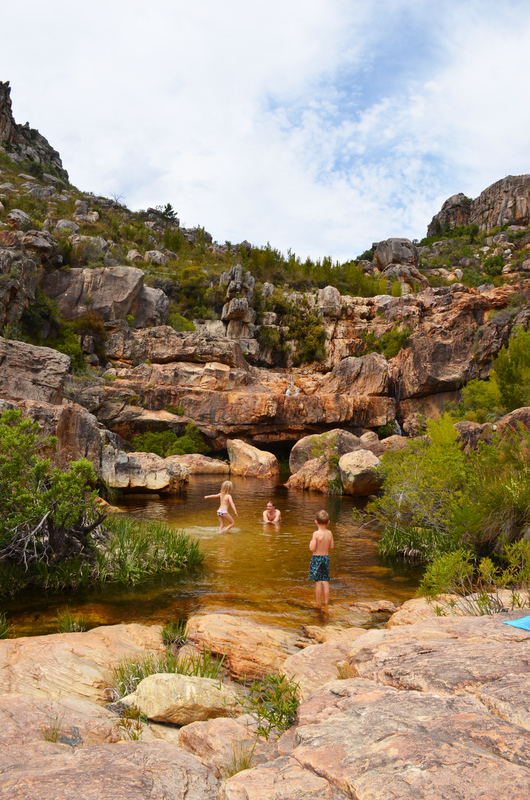 “The most incredible rock pools”… “such a great getaway” … “an escape from everything, no phones, no music, just crackling campfires at night”. Honestly, I thought everyone was making much a do about nothing. Until we got there. 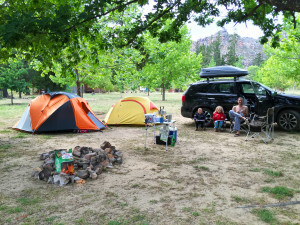 The campsite is nothing particularly special, especially if you are allergic to Plane trees, as is my predicament. The majority of it is grassed, slightly sloping, but perfectly comfortable to camp on. The combination of Plane and Oak trees offer a fair amount of shade, but if you are there in spring time make sure you have allergy meds with you, the ‘puff’ balls spare no expense in ensuring the entire area is covered in a light dusting of pollen and fibres. Now although the camping area is nothing to write home about, setting foot along the path towards the main ‘rock pool’ gives you an idea that there may be something magical lurking around the corner. The path very quickly becomes rocky and difficult single track, made especially difficult by the fact that we were all on our bikes. Not anticipating what lay around the bend, we made a frankly ill advised decision on our means of transportation. After discarding our bikes behind a rather large, shrub-obscured boulder, we proceeded on foot. By far the better decision as it turned out; the rocks would have been un-navigable on wheels, even for the most seasoned professional. 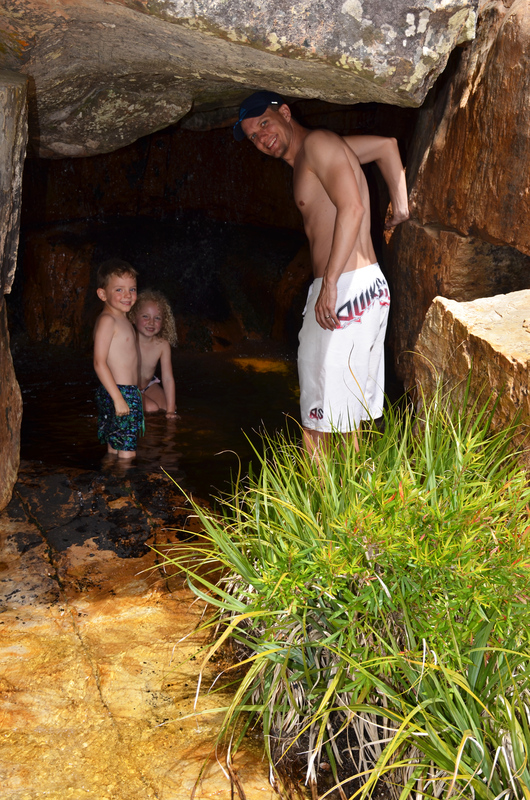 To say I was surprised when I saw the rock pools would be an understatement. It was like finding an oasis in a desert. 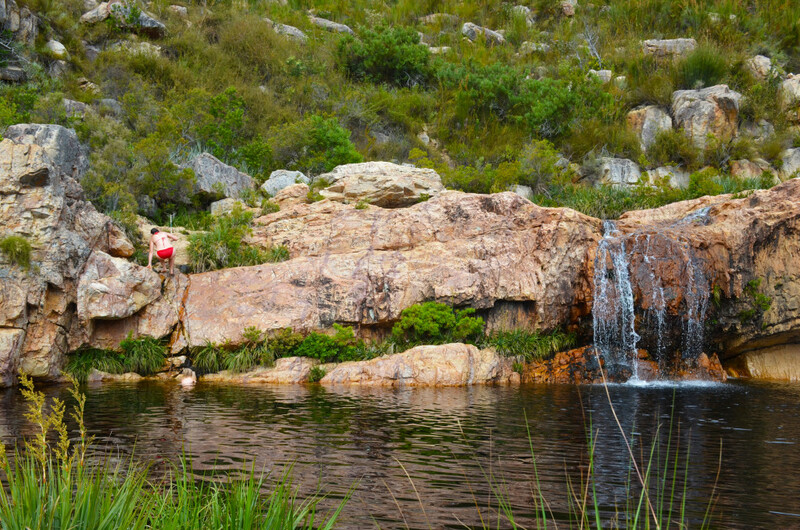 One minute you are walking along rugged mountainside, and the next you are standing opposite a 3 meter wide waterfall, a large pool of fresh mountain water at its base. 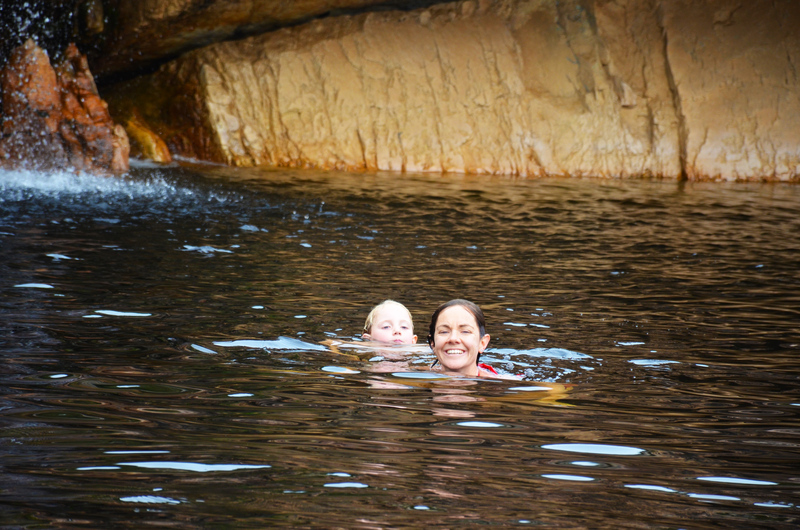 It is surrounded by sloping rocks and vegetation, both of which you can use to get in and out of the clear, deep water. 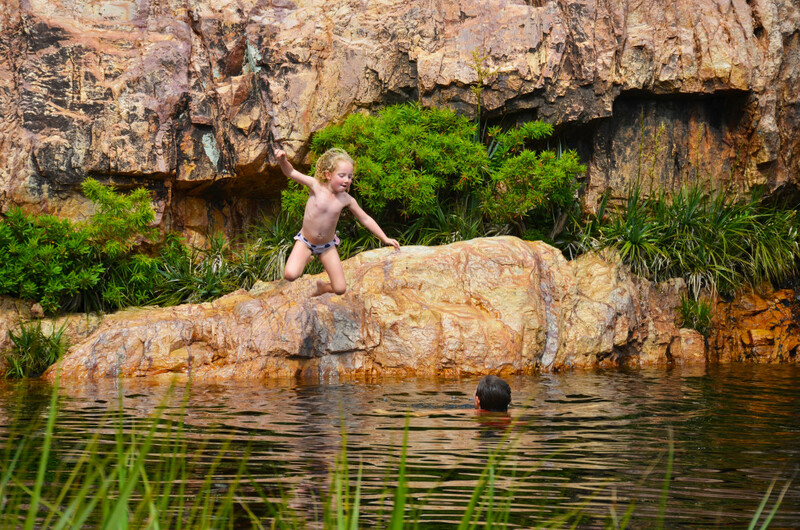 It is brackish, and cold, but so invigorating to jump off the top of the waterfall into the pool below. As we arrived on a Thursday morning, we had the place almost entirely to ourselves for a day, and it was magical. Climbing up to Jump off the falls. 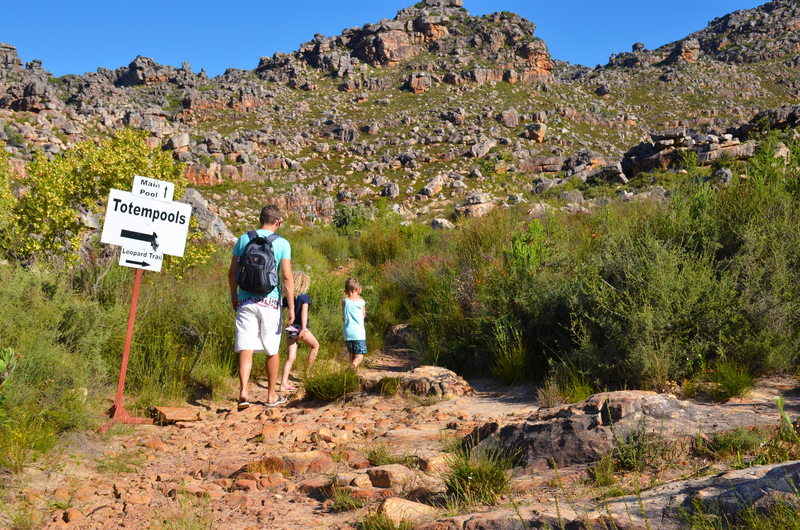 On the Friday, we decided to walk up the Leopard trail in search of the Totempools. 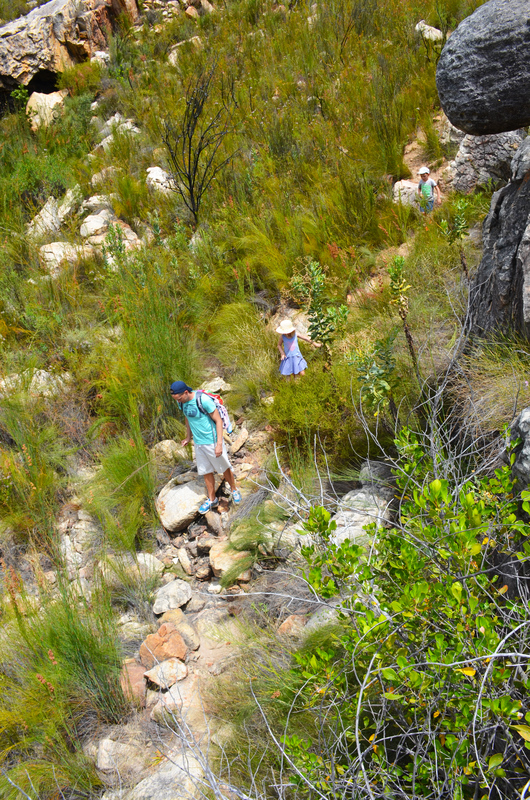 It is a lovely walk, winding you up the mountain alongside the river. 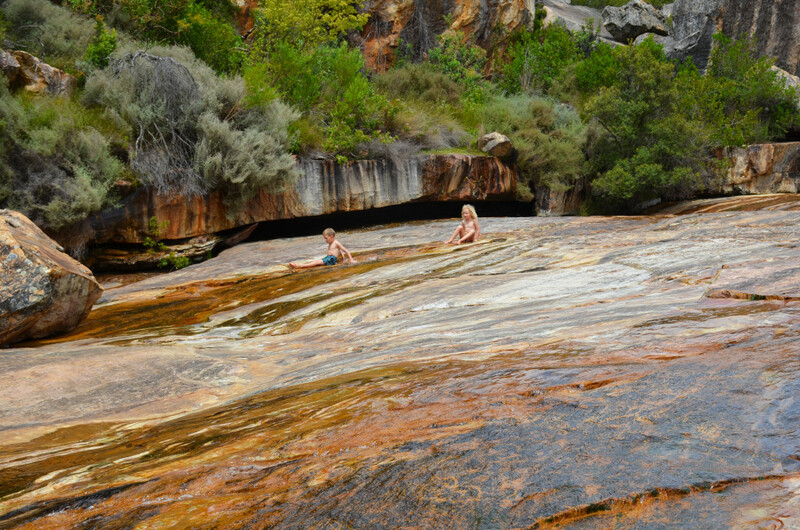 About half an hour up we stopped at the ‘bum slides’, so named because the long stretch of flat rock is perfect for sliding down, when there is enough water in the river that is. 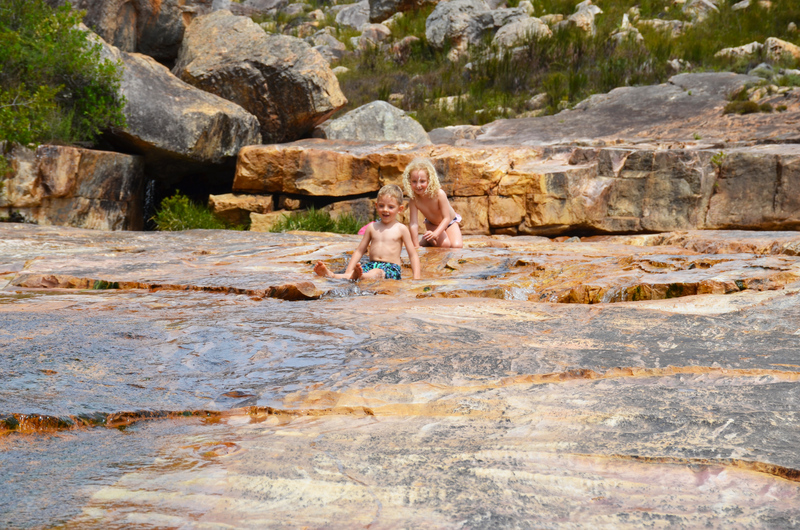 Given that South Africa has been rather racked by global warming of late, we found little joy in sliding down the rocks on our bottoms, particularly with a son like Lincoln who managed to almost concuss himself, crack open his head and lose a limb in a matter of minutes. 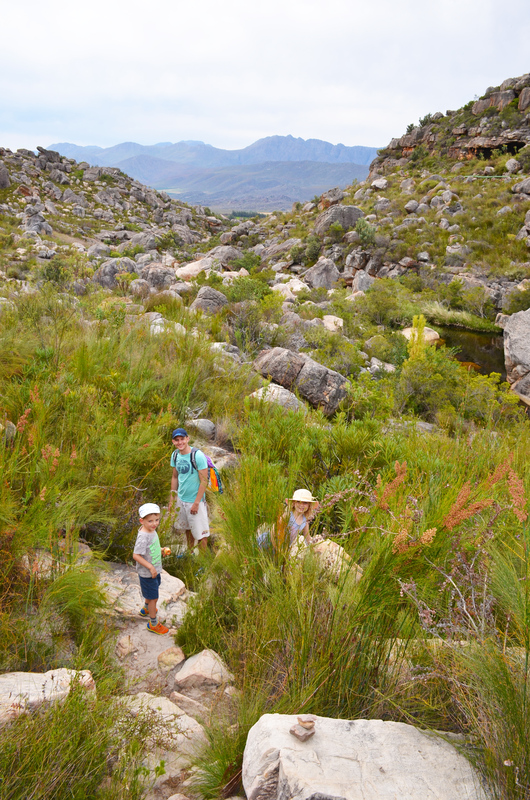 We opted instead to continue our climb in search of the elusive pools. Lincoln on his way down to getting wedged under the rock! Lincoln just before he fell over and landed on his head! And elusive they definitely were. Climb as we might, we are not sure if we were met with success. After taking the wrong path a couple of times, sending Shaun up the mountain ahead of us to try and figure out which was the right route, and eventually succumbing to the heat, we stopped at what we thought was a pretty good ‘potential’ Totempool. We are still not sure if that was the Totempool or not. 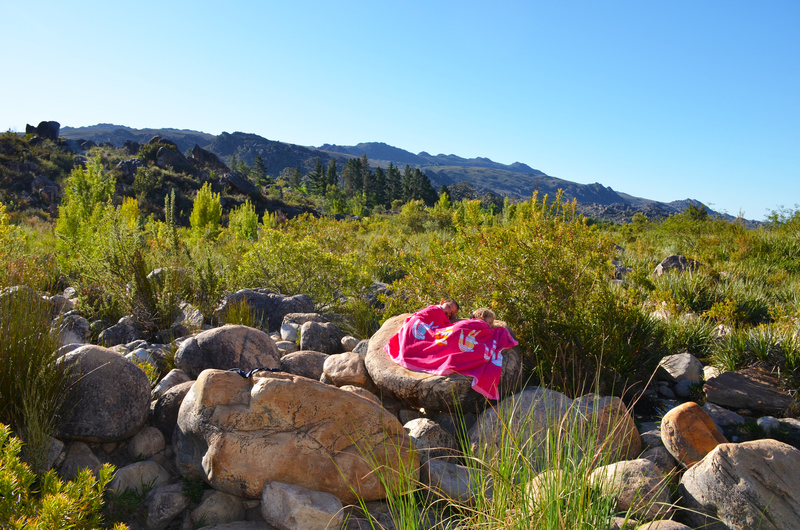 It was incredibly beautiful however, and a prefect place to spend a few hours lounging on the rocks and frolicking in the fresh mountain pools. 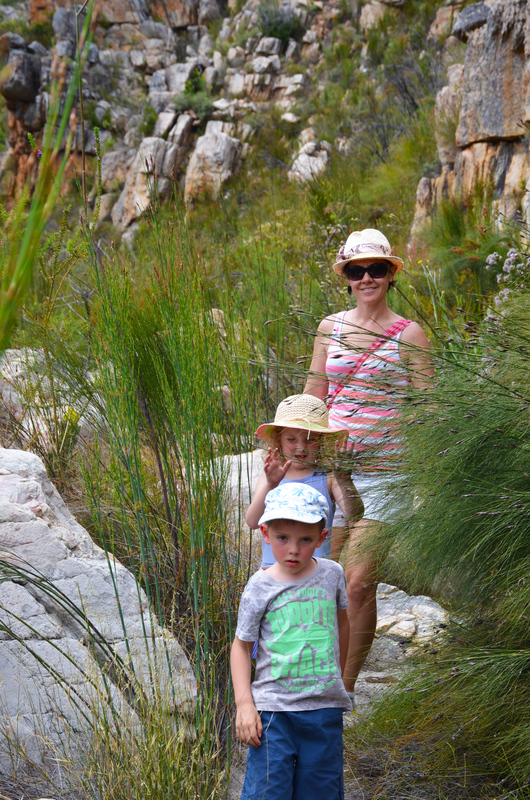 The solitude we were spoilt with made our first two days at Beaverlac idyllic. Arriving back at the campsite after our walk on Friday evening, we were greeted with a swarm of weekend arrivals. Being a dog-friendly spot meant that there were more than a few exuberant canines leaping about. For the most part under control, but there were a few angling for a tent to mark as there own. It was by no means ridiculously busy, but after being spoilt by having the pools to ourselves for the first few days meant we were happy to hit the road the next morning. 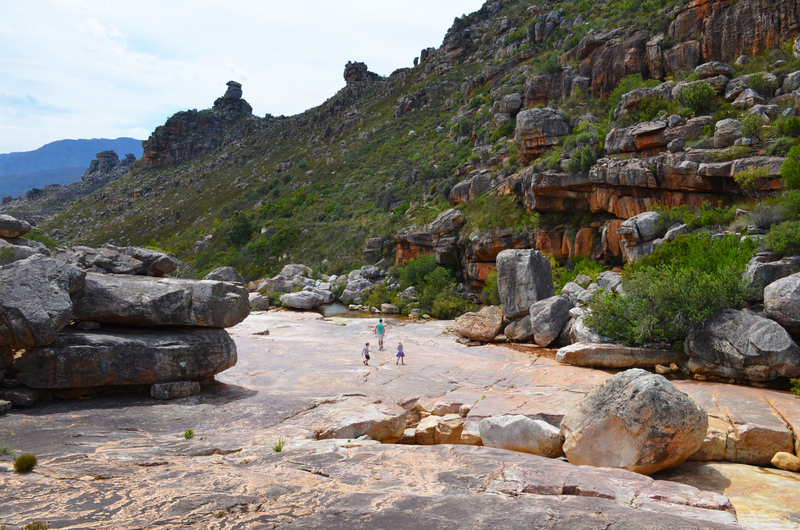 Leaving was not easy however, the dance of the water over the tumbling Cederberg mountains and the therapeutic crashing sound it makes as it plummets into the pools of fresh mountain water left us hankering for more. It is a place I would visit again and again – solitude being a prerequisite of course. Go with the intention of leaving noise, social media and a constant stream of interruptions behind, and you wont be disappointed. I guarantee it.